Click here to download directions and game parts! 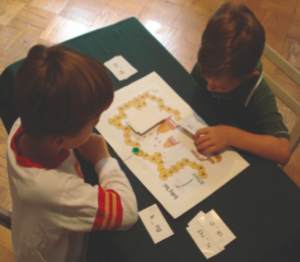 Bee Smart Concepts is the creator of structured literacy material and games that support the Orton-Gillingham approach. Orton-Gillingham is a multi-faceted program that was created specifically for dyslexics but suitable for any student in a structured literacy program. With the Orton-Gillingham approach, one teaches reading, writing, and spelling by using auditory, visual, and tactile measures. Bee Smart takes Orton-Gillingham from just explicit (direct instruction) to implicit (games for re-enforcement) as well. Engaging a student in a game that supports developing that skill toward automaticity takes the “drill and kill” out of learning. Take the boredom out of over learning with Bee Smart Concept’s games. Students with working memory deficits require over 500 to 1500 repetitions to acquire automaticity for reading and spelling fluency. Most students can benefit from these games that are designed to support structured literacy but students with poor working memory, slow processing speed or specific language disability, such as dyslexia, must master phonemes, syllable patterns, high frequency words and spelling generalizations. Mastery comes with repetition but need not be boring and can be engaging. Bee Smart games are used by Bee Smart trained tutors, parents and teachers in schools with small group resource programs. For further information about Bee Smart Concepts, tutors, training, or consulting, please contact Bee Smart Concepts at beesmartconcepts@verizon.net.